I know that I am bashing my head against the wall but after someone posted on Money Management about how Martignale works for "their friend" whilst playing roulette then I just have to put them straight. Okay let's try and decipher their post. "if used on very short price say evens or lower you do not get into much trouble as a very big number of the shorts do win say 70% so you roll the dice your way a mate of mine did do very well following the last spin at the casino red or black he changed colours when the dealer spun red his next bet was red if the dealer spun black his next bet was black when the run came of 12 blacks or reds he won a small amount of money that keep him in the lap of lux he would also time himself one hour maybe 2 a week and leave so good luck try it on paper oneday you will see its not bad and there are worse"
Amongst the lack of grammar (a sure sign that I am going to struggle to make them understand) I think I discern the following; bet on evens or shorter, 70% of short prices win, something about betting on the wheel's last colour, a small amount of money keeps you in the lap of luxury, limiting your time in the casino and try it out on paper. Well, for a start, we can do better than trying it out on paper. We are going to simulate this hundreds of times on a computer. The reference to evens or shorter and 70% of short prices win seems to be taken from horse racing. 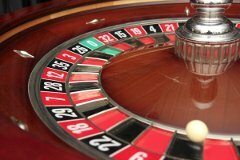 When playing roulette you know exactly what the probabilities and payouts are and don't need to be so vague. I wonder if this person has actually played roulette as he makes no mention of the green 0 (or the additional green 00 on American wheels). The fact that there is a green cup on a roulette wheel means that roulette is a losing proposition before you even consider a staking plan. Let's look at the probability of a winning bet and its payout for betting on red or black. A European roulette wheel has 37 cups, 18 are red, 18 are black and 1 (the 0 cup) is green. When betting either red or black, your bet loses if the ball falls into the green cup. There are no bets on green. The return, should your bet be a winning one, is even money. = (1 * 0.486) + (-1 * (1-0.486) = -0.027 recurring. And so, even before we sprinkle the Magic Martingale dust we should know that roulette is a losing propostion. For every £1 bet, you are going to lose 2.7p. In the interests of completeness we will continue and do some simulations. 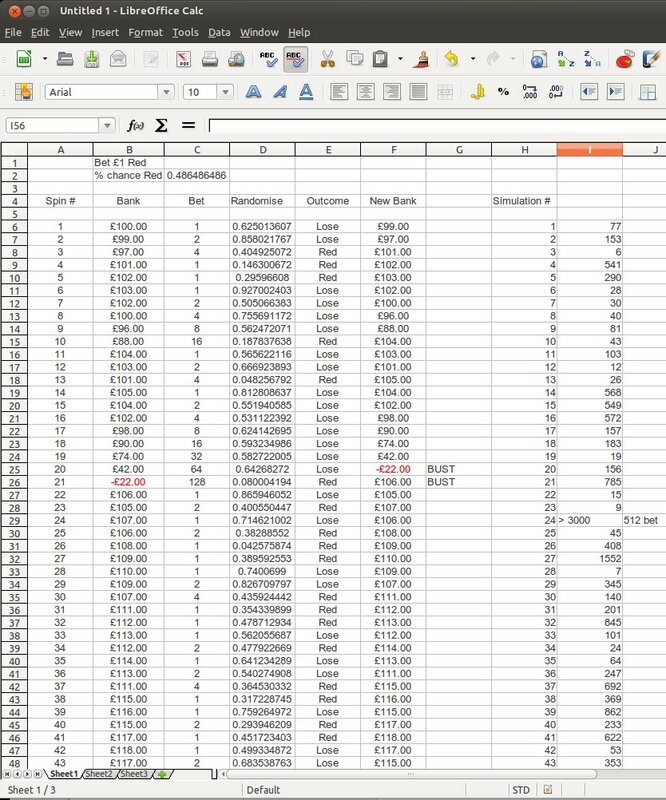 There is no need to write any simulator software, just a spreadsheet will do. 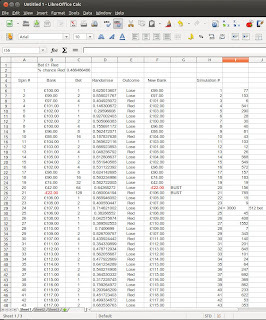 In our spreadsheet Column A is the spin number, Column B is the bankroll before the spin, Column C is the bet size in multiples of £1, Column D is the randomise function, Column E is a conditional function determining if our bet on Red has been successful and Column F is the new bankroll after winnings have been added or losses taken away. Our Martingale System was to bet £1 initially, doubling the bet after a loss and resetting the bet to £1 after a win. We ran the simulator 100 times to determine the average number of spins it takes to go bust. The answer was 172 spins over 98 simulations. "Ah but," you say, "my friend would only play for 2 hours. He's not going to play an average of 172 spins. He'll be at home counting his winnings." The roulette wheel has no memory of how many hours you play each time. It doesn't matter if you only play 100 spins and go home each night. The Law of Large numbers means that over time you will play thousands of times and go bust many times. Why 98 simulations and not 100? Well, I only ran the simulator to account for the first 3000 spins but on two occasions the bankroll was still intact after 3000 spins. This brings us to another problem with the Martingale system; table limit. Casino operators know that there is a very small chance of someone with a sufficiently large bankroll "breaking the bank" and so they have a tablet limit rule. For example, in Las Vegas a typical roulette wheel might have a $10 minimum bet and a $2000 maximum bet. Let us assume that a Martingale System user turns up at the aforementioned Las Vegas wheel with $2000 and starts by betting $10. He immediately hits a losing streak and starts doubling up after each losing bet. After a losing streak of just 7 he already requires a bet of $1280 and if that one loses too then he will go over the table limit requiring a $2560 bet. In our 3000 plus spin simulation there were two simulations that needed 256 and 512 times the initial £1 bet. This would have required doubling up 8 and 9 times the table minimum, which would not have been permitted. We would always be chasing our losses but never allowed to bet enough to recoup those losses. What people who play roulette on paper do not understand is that losing streaks will soon double up your bet to over the table limit and you will never be able to get your losses back. If the table limit was set higher you would require an even bigger bankroll to recoup losses. Even a winning streak doesn't help because you are not getting a fair pay off for the odds. What can we learn from this exercise? A losing proposition is a losing proposition and no money management system will turn a loser into a winner. Kelly Criterion tells us to bet more when we are winning and less when we are losing. In other words, chase your winnings and not your losses. If a bet has negative expectation then don't bet. If your expectation is positive then your bet size must be in proportion to your advantage. Finally, go over to YouTube and look for some Martingale System videos. Those videos that debunk Martingale have comments enabled and those that propose that you should use Martingale usually have comments disabled. Need I say more? Whilst I wouldn't put it past an unscrupulous website owner to run a crooked game the house advantage is enough to turn a profit without rigging the game. How many spins of the wheel constituted your sample? Why on earth were you playing the game at all? Roulette is a losing proposition for any player regardless of randomness. In it you will see a graph of possible expectations for a given game. Even if a game has a negative expectation then a very small minority will be lucky enough to make a profit even if the vast majority make a loss. The overall expecation for the crowd is negative but you got lucky. Invest your £500 wisely. If you reinvest it in roulette I guarantee you will lose it all. Agreed, that was last year and since then I have been investing time/money in getting a few trading strategies working so I can focus on uni instead of stacking shelves. If you don't mind me asking are you trading full time? I invest full time and sports trading is just a small part of the portfolio. You can add P2P lending, shares and eBay selling to my list of income sources.